Since 1998, Earnings Whispers has published 98,632 Earnings Whisper numbers and, 71.5% of the time, the Earnings Whisper number was the most accurate published expectation by gathering the true expectations of 11,513 professional analysts - people who actually get paid to tell hedge funds, portfolio managers, and broker clients their projections. Back in the 1960's, Ray Ball and Philip Brown discovered a market anomaly known as the Post-Earnings Announcement Drift (PEAD). Numerous studies since have confirmed the anomaly since, but since the Earnings Whisper number better reflects the market's expectation, investment models aren't changed merely by a beat or miss of the consensus estimate. Consequently, at least since 1998, stocks have only drifted in the direction of the surprise when it is based on the Earnings Whisper. Combining the analysts' checks that make up the Earnings Whisper number, with measures of investor sentiment, we can score the likelihood a stock will see an Earnings Announcement Premium (EAP) - first discovered by William Beaver in 1968 - and move higher going into its earnigns release or move lower ahead of the news. Much of the Post-Earnings Announcement Drift comes during the first several days after the earnings release but we've learned that, at least since 1998, there are some pieces of information that mean more for the longer-term drift and some things matter more to the short-term drift. The Power Rating focuses solely on the earnings and sentiment data that matters most for the short-term trade. Piecing everything together - short-term trades based on a combination of the true expectations of professional analysts, investor sentiment and technical analysis, then tested with quantitative formulas that have been shown to significantly outperform. 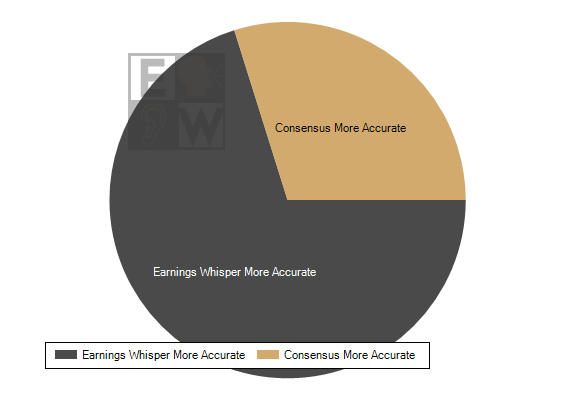 Using the Earnings Whisper ® Score, these are the stocks most likely to return the Earnings Announcement Premium (EAP) ahead of the company's earnings release and through the open following the news. Not all earnings and earnings surprises have the same impact on a stock's price - some have more power behind them for that short-term drift following the announcement. It is the professional analysts that the "smart money" follows and here are some brief comments about the company's they follow and their ability to meet or beat estimates. Stocks with favorable earnings statistics pointing towards a "drift" into its next earnings release while also providing a technical setup for a trading opportunity. Discussions of stocks meeting criteria for a trade along with the technical setup with support and resistance areas. Stocks making strong moves following their earnings release can sometimes signal how their industry peers will report. Details into the actions of option traders leading up to a company's earnings release and the move traders are willing to price in ahead of the news.